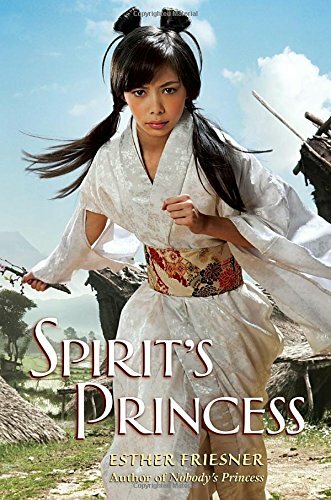 Esther Friesner vividly reimagines the early life of Queen Himiko, fabled leader and sorceress of the Yayoi people of third century Japan in this latest story from her exciting and unique Princesses of Myth series. Seven-year-old Himiko of the Matsu clan is smart, confident, and as the only daughter of the clan chief, a little bit spoiled. She longs to do everything her favorite brother, Aki, the eldest, does. Most of all, she wants to be a mighty hunter like he. “My dreams of the future were never small,” she remembers. And they were frequently denied. Himiko’s world—Japan around 230 ACE—is one of hard work, loyalty to family and to clan and respect for the dangerous mystical forces that are believed to control the world: forces like the great dragon underground, who makes the earth shake, myriad spirits who bring rain and drought, health and sickness, war and peace, and Grandfather, spirit of the mighty pine tree that grows in the middle of their village. But Himiko doesn’t fear the spirits the way everyone else does. She doesn’t think the clan should spend time making offerings to capricious, cruel beings who seem to take delight in how much people fear them. Her courage earns her a broken leg when she climbs to the top of Grandfather pine to prove her bravery, but the fall doesn’t change her mind. In this, book one of Himiko’s story, author Friesner takes us into Himiko’s childhood and teenage years. As she grows, Himiko’s courage will take her far from her roots, causing her to question everything from the spirits’ existence and her father’s rigid rules to her own place in the world. Her courage will also lead her people to power in ancient Japan. As she did with previous histories in the Princesses of Myth series (Helen of Troy, Queen Nefertiti), Ms. Friesner has woven a thoroughly immersive and magical “biography” from the tantalizing but meager historical facts about Himiko that have survived. She brings this early princess to colorful life with crisp, believable details drawn from in-depth historical research. In the past, many historical novels for kids focus on the lives of famous men while princesses remained largely passive, unremarkable figures. It’s not only refreshing but fascinating to see the recreated lives of these historical—and decidedly non-Disney—princesses as they grow in age, power, and wisdom.